Williams Lake, B.C. – Increased activity of the Elephant Hill fire has lead to the issuing of an evacuation order for an area south of Highway 24. Effective immediately, the evacuation order includes the areas of Watch Lake, Little Horse Lake, Little Green Lake and the western side of Sheridan Lake. 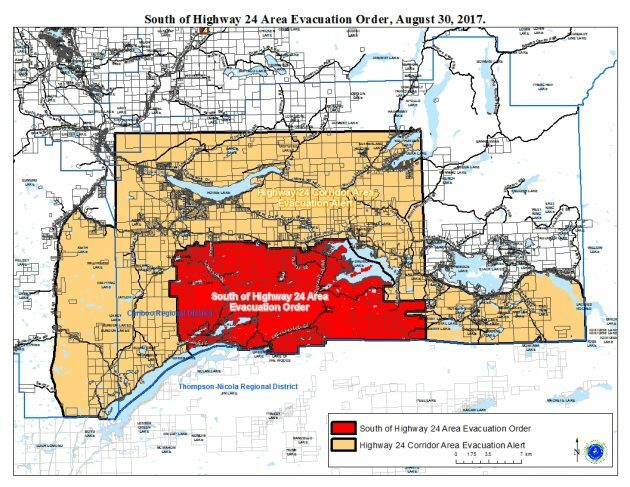 Adjacent areas south of Highway 24 remain on evacuation alert and the alert has now expanded to include some areas north of Highway 24. Robert Turner, Assistant Deputy Minister for Emergency Management BC says the Canadian Armed Forces are on stand by in the event their services are needed to assist in this evacuation. Sure wonder how that one got going? Human caused and under investigation. Started beside train tracks on the Ashcroft Reserve. Nothing to do with trains.